Protecting student safety has been the rationale behind the recent spate of laws restricting teachers' and students' communication via social networking. The laws call into into question once again the educational value of these sorts of online social tools: Why do teachers need to talk to students on Facebook? Shouldn't students be studying? Isn't Facebook just a waste of time? There are many arguments for using social media in education. (For example, here are 50 reasons to allow Facebook in your classroom.) One of the most powerful arguments is simply because Facebook is, and has been since its creation, a Web site that students want to use. Remember, though its audience has exploded to 750 million, Facebook was created exclusively for college students. Instead of the typical Facebook prompt, "What's on your mind?" Hoot.me asks its users "What are you working on?" The question is: how to leverage Facebook for learning purposes? There are a number of new tools that aim to blend social and studying aspects. One of them is Hoot.me, a Facebook application that turns the social networking site into "study mode." Like other Facebook apps, Hoot.me keeps you inside Facebook but moves you away from your wall and news feed. Instead of the typical Facebook prompt, "What's on your mind?" Hoot.me asks its users "What are you working on?" From there, students can join the live study sessions on that topic. These sessions can use group video-conferencing, which Facebook itself doesn't yet offer, as well as the "smart chat" function. Smart chat allows you to type mathematical formulas in English, which are then automatically translated into mathematical notation. A screen-sharing option is coming soon, too. Hoot.me also saves and archives the study sessions so that people can search for answers in other, older study sessions. Using the Facebook "social graph" (that is, the information in your Facebook profile -- where you live, where you go to school, your friends, your likes), Hoot.me tries to match students with others from the same school or from within your social network. Hoot.me was initially created as a student-oriented tool: the co-founder and CEO Michael Koetting said he came up with the idea during a late-night study session at UT Austin when he couldn't solve a calculus problem, couldn't find anyone in his dorm to help and couldn't text an intricate math problem, even if he knew whom to text. But as the startup has developed, Koetting recognized that it can be useful for educators to communicate with students this way too. As such, Hoot.me has added new features that make it possible for teachers to hold "virtual office hours" of sorts. These sorts of sessions can be private, should participants choose, which means that they won't show up in the news feed. And Hoot.me makes study session invitations available through a short-link, so that you don't have to "friend" a student to invite her or him to a group. Koetting says he plans to add private tutoring services through the app in the near future, and this will be the means by which the startup will monetize its efforts. 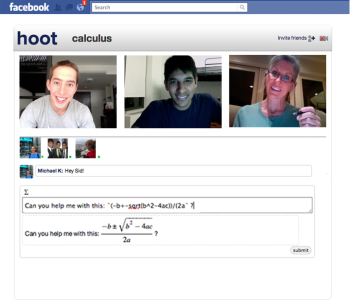 Tutoring via Facebook. Studying via Facebook. Textbooks via Facebook (a recent addition to the textbook app Kno). It's pretty clear that despite the dismissal of Facebook as a danger or a distraction, it is the place where students are turning to collaborate and communicate about their school work.